Barcelona offers visitors good value for money when compared to other popular European cities such as London, Paris, Berlin or Rome. Having said that, the city is packed with attractions and with entry fees generally between €5 and €20, the cost can quickly add up. Luckily there are several discount cards and sightseeing passes which can help you save money without missing out on anything. In addition to saving money on entry fees, the discount cards offer savings on a wide range of tours, activities, entertainment, transport, night-life, shopping and even meals in selected restaurants. They also make life easier by allowing you to group all your tickets plus transport together in one convenient pass. Each of the passes is slightly different and which one is best depends on what you plan to see and do and how long you will be staying for. In this post we take a look at 7 of the most popular passes and weight up the pros and cons of each one. Plus we’ve included an interactive price comparison calculator to help you work out how much you will save. Summary – Which Barcelona Sightseeing Pass is Best? The Barcelona Card is the official sightseeing pass sold by the city’s tourist office. The card offers free entry to 17 museums and discount entry to 24 other museums. It also includes free unlimited travel by public transport including the metro and train from the airport. The 3, 4 or 5 day Barcelona Card offers a total of more than 70 discounts at attractions, museums, tours, shows, activities and night-life as well as some shops. Which attractions are covered by the Barcelona Card? The National art museum of Catalonia (MNAC), Picasso Museum, Joan Miró Foundation, Barcelona History Museum (MUHBA), Barcelona Museum of Contemporary Art (MACBA), the Chocolate Museum, Barcelona Botanic Gardens, Pedralbes Monastery, Cosmo Caixa Science Museum, Barcelona Botanic Gardens, El Born Cultural Centre, Museu de Modernisme Catala. 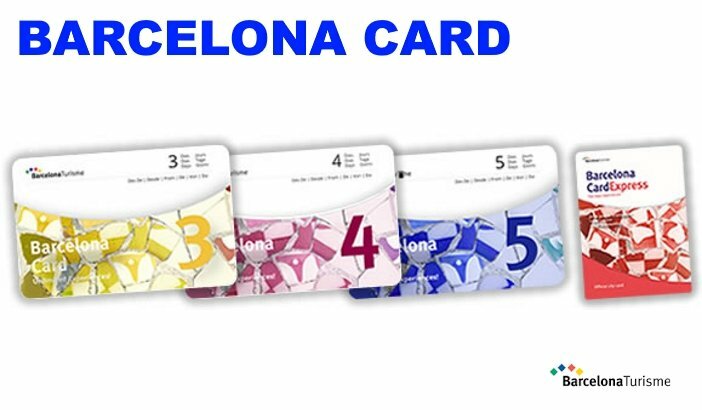 The Barcelona Card includes an unlimited travel on the metro, bus, trams and commuter trains within travel zone one for the duration of the card. This includes free airport transfer on the L9 metro, R2 airport train and bus number 46. What else is included with the Barcelona Card? The Barcelona Card also includes a free guide and map. What isn’t covered by the Barcelona Card? The list of attraction and tours which are covered by the Barcelona Card are so extensive that I think it’s worth mentioning the attractions which aren’t included. Most importantly, the Barcelona Card doesn’t include entry to La Sagrada Familia or Park Güell. Tickets for both attractions can be purchased separately or together as the Gaudi Bundle (more information below). The Aerobus fast shuttle bus from the airport to the city centre is also not covered by the Barcelona Card. The Barcelona Card is a smart card which can be purchased at official Barcelona Turisme tourist offices in the city centre or at the airport. You can save an extra 10% by purchasing your ticket online. You then pick up the card, guidebook and map from one of the tourist offices upon arrival (more information below). There are 3 cards available, all of which are valid at the same attractions and for the same discounts, valid for 72, 96 and 120 hours from the first time you use them. To use the card you simply show it at the ticket counter when visiting each of the attractions. In the case of the Picasso Museum, in order to skip the line, you should contact the museum in advance to book a time slot. Likewise, you should reserve Barcelona walking tours at least 24 hours in advance. The duration of the Barcelona Card is timed from the first time you use it. For example, if you purchase a 72 hour Barcelona Card and the first time you use it is to catch the train from the airport to the city centre at 7pm on a Friday evening, the card can be used right up until 7pm on Monday evening. Barcelona Airport Terminal 1(on the right just after you go through customs), Barcelona Airport Terminal 2 (near Botero´s horse statue), Plaça de Catalunya 17, Carrer de Pelai 39, Plaça Nova 5, Plaça de Sant Jaume 2 (Barcelona Town Hall), Passatge d’Amadeu Bagués 2 (Las Ramblas) Plaça del Portal del Pau s/n (Columbus monument), Plaça dels Paisos Catalans (Barcelona Sants Train Station). Valid at a wide range of attractions and activities. Includes free guide, free map and free unlimited travel on public transport. 8 pickup points including Barcelona airport. Doesn’t include La Sagrada Família or Park Güell. 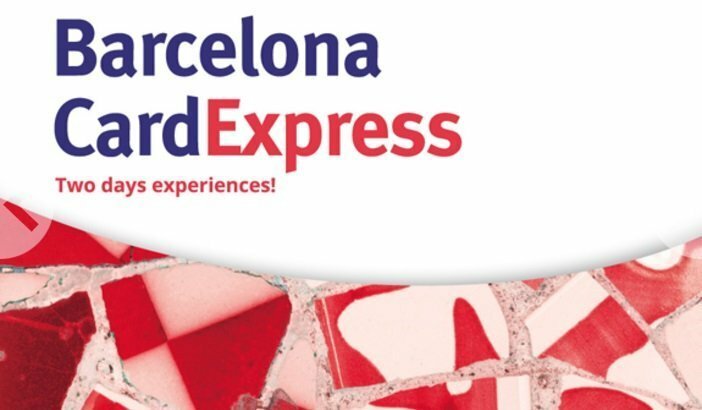 Barcelona Card Express is a stripped-down version of the Barcelona card which is valid for 2 days. Unlike the Barcelona card which includes free entry to 17 museums, the Barcelona Card Express doesn’t include free entry to any sites, just discounts and unlimited travel on public transport. If you are only visiting Barcelona for 2 days and were already thinking about purchasing the Hola Barcelona! travel pass then it might be worth paying a few extra Euros and getting the Barcelona Card Express. Which attractions are covered by the Barcelona Card Express? The Barcelona Card Express includes unlimited travel on the metro, bus, trams and commuter trains within travel zone one for 48 hours after the first time you use it. This includes free airport transfer on the L9 metro, R2 airport train and bus number 46. What else is included with the Barcelona Card Express? How does the Barcelona Card Express Work? The Barcelona Card Express is valid for 48 hours from the first time you use it and can be purchased at official Barcelona Turisme tourist offices in the city centre or at the airport. You can save an extra 10% by purchasing your ticket online. To use the card, you present it at the ticket office when visiting the attractions. In the case of the Picasso Museum, in order to skip the line, you should contact the museum in advance to book a time slot. Likewise, you should reserve Barcelona walking tours at least 24 hours in advance. Not much more expensive than a travel pass. Valid in a wide range of attractions and activities. Free map and free unlimited travel on public transport. Barcelona City Pass includes fast-track (skip the line) entry to the Sagrada Famillia and Park Güell as well as the Hop-on Hop-off buses, airport transfer and 20% discount on the majority of the city’s top attractions. For short visits, the Barcelona City Pass includes all the essentials in one ticket which you can purchase online before you arrive. For longer stays, there’s no time limit so you can see everything at your own pace. Which attractions are covered by the Barcelona City Pass? Skip the line entry to the Sagrada Familia plus audio guide. Skip the line entry to Park Güell plus audio guide. 1 or 2 day pass for the Hop on Hop Off open top bus tours. Return transport between Barcelona airport and the city centre on the Aerobus express shuttle bus (or one way from/to Girona Costa Brava Airport). The Barcelona City Pass is 100% digital. During the booking process you indicate which airport you will be arriving at and select entry times for the Sagrada Familia and Park Guell. You then receive your tickets via email, there’s no need to print them out, just show them on your phone. This has the advantage that, on arrival in Barcelona you hit the ground running and can head straight to the Aerobus, no need to pick anything up. You also get an audio guide app to listen to on your smartphone (don’t forget to bring earphones) plus a coupon code which gives you 20% discount on Barcelona attractions, tickets and tours purchased from the Ticketbar website. There’s no time limit on when you use the discount code and no booking fees. This is a bonus if you will be staying in Barcelona for more than just a few days because you can spread your sightseeing out over a longer period. After booking you receive a link to the Ticketbar website. When booking through this link there is an extra text field in the shopping cart where you enter the discount coupon code. When you validate the code the 20% discount is automatically applied to your order. Includes fast-track entry to the popular Sagrada Familia Basilica and Park Güell (reserve time slot when booking). Includes airport transfer from Barcelona or Girona airport. Discount on a wide range of attractions, tours and activities and shows. Travel pass for public transport available at extra cost. Articket Barcelona gives access to 6 of Barcelona’s top museums including the Picasso Museum, Miró Foundation and the MNAC. If you visit all 6 museums, represents a 50% saving compared with purchasing individual tickets. Before you purchase the Articket you should check whether any of the museums offer free entry during any of the days which you’ll be visiting Barcelona. Read this post for more information. Which attractions are covered by Articket Barcelona? 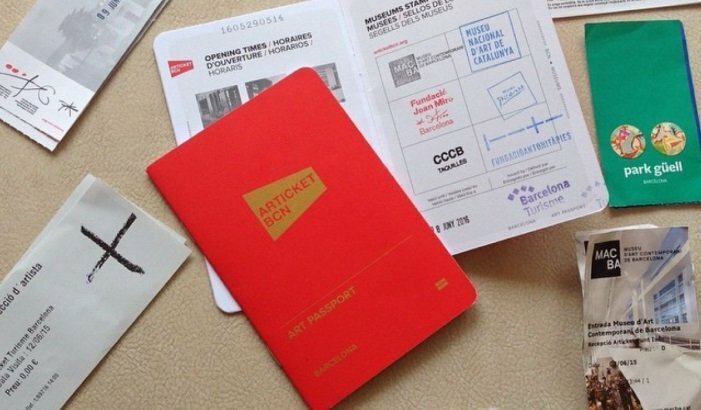 Articket Barcelona (aka the Art Passport) can be purchased at any of the featured museums or online, you then pick up the pass at the first museum you visit. Each time you visit a museum the Articket (which looks like a passport) is stamped. The Art Passport is valid for 12 months and allows you to visit each museum once. Save up to 50% at 6 of Barcelona’s best art museums. Includes fast-track entry to the Picasso museum. The Gaudi Bundle was conceived as an add-on to the Barcelona Card and Barcelona Card Express but can also be purchased separately or combined with other sightseeing passes. The pack includes fast-track access to the Sagrada Familia and Park Güell plus an audio guide for both sites. 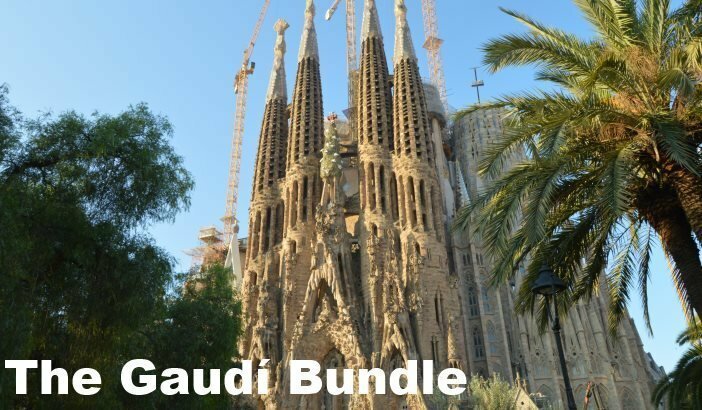 Which attractions are covered by the Gaudi Bundle? The Gaudi Bundle includes fast-track (skip the line) access to the Sagrada Familia and Park Güell plus an audio guide for both sites. The Gaudi Bundle is 100% digital and works the same way as the Barcelona City Pass. After booking you reserve entry times for the Sagrada Familia and Park Güell and download the audio guide app to your smartphone. You then show your tickets directly on your phone, no need to print them out or pick anything up. Tip: Don’t forget to bring earphones with you to listen to the audio guide! Fast-track entry to 2 of Barcelona’s most popular attractions. If you don’t want the audio guide then it’s cheaper to purchase the tickets separately online. The iVenture card allows you to choose 3, 5 or 36 attractions, tours and activities from a total of 36. The activities offered include tours of popular sights such as the Sagrada Familia and Montserrat as well as boat trips, scooter hire, Portaventura and the FC Barcelona Experience. If you plan take the more expensive tours and activities which are available then the iVenture card is very good value. You should compare prices carefully before purchasing because some of the activities work out cheaper when booked separately on the Barcelona Tourism website. Which attractions are covered by the Barcelona iVenture Card? The Sagrada Familia (tour), Montserrat Mountain (tour), Gaudi Experiència, Park Güell (tour), Hop On Hop Off bus tour, Barcelona Highlights (tour),Barcelona Aquarium, Picasso Museum and Gothic Quarter (tour), Columbus Monument, La Pedrera, Port Aventura, Barcelona City Tour, Gaudi Exhibition Centre, Hard Rock Café (meal), Casa Vicens (tour), Sant Pau Art Nouveau Site (tour), Artistic Barcelona (tour), Santa Maria del Mar rooftop tour, Las Golondrinas (boat tour), Casa Batllo (tour), Casa de les Puntxes, Colonia Güell, scooter rental, FC Barcelona experience, Torre Bellesguard, Girona Game of Thrones Tour, La Roca village shopping express, MNAC, the Egyptian museum, Palacio del Flamenco (show), Palau Requesens (tour and show), Poble Espanyol, La Burguesa restaurant (meal), Txapela restaurant (meal), Barcelona Casino. What else is included with the Barcelona iVenture Card? The Barcelona iVenture Card also includes a free guide and map. 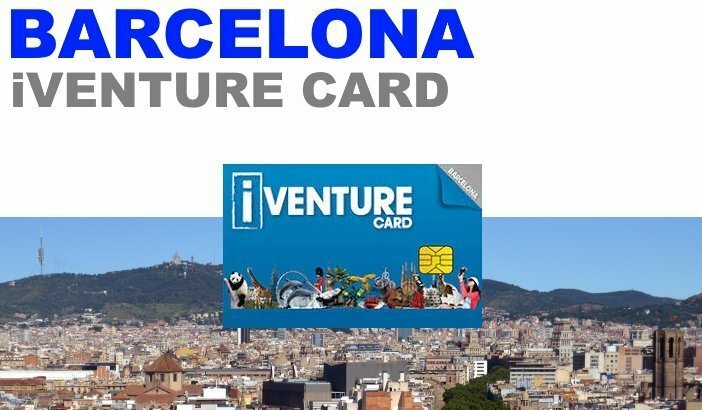 How does the Barcelona iVenture Card work? The card is valid for 7 consecutive calendar days (not 24 hour periods) from the day that the card is issued. This means that if you collect the card on a Friday mid-day, you can use it until the following Thursday evening. Carrer Balmes 5, Carrer Canuda 9, Carrer Hospital 4 and Plaça de la Sagrada Família 3. Flexible 7 day pass which could save you up to 40% on popular tours and attractions. 4 pickup points in Barcelona city centre. Check the price of each of the activities before making your selection. The Barcelona Pass is a 2 or 3 day sightseeing pass which gives you free entry to 25 of Barcelona’s most popular attractions, a free ticket for the Hop On Hop Off bus tours plus discounts for a selection of other tours. In many ways it’s similar to the Barcelona Card except that it’s less museum oriented and includes more of Barcelona’s most popular attractions for free. Unlike the Barcelona Card, the validity of the Barcelona Pass is based on calendar days instead of hours so, to get best value for money, it’s important that you start using it early in the morning on the first day. Which attractions are covered by the Barcelona Pass? La Pedrera, Casa Batlló, Casa de les Punxes, Poble Espanyol, Catalunya in Miniature, FC Barcelona Camp Nou Tour, Barcelona Zoo, Museu de la Música, Casa Vicens, Gaudi Exhibition Centre, Barcelona Waxworks Museum, Museum of Ancient Egyptian Culture, The Museum of Modernism, Liceu Opera House (guided tour), Caixa Forum, Best of Barcelona Bike Tour, Cosmo Caixa (science museum), Las Golondrinas (boat tour), Museum of Contemporary Art Barcelona (MACBA), Bus Turistic (Hop on Hop off bus tour), Gaudi Experiència 4D, Barcelona Walking Tours, La Roca Village (shopping express), Sant Pau Art Nouveau Site, Colonia Güell and Gaudi’s Crypt. What else is included with the Barcelona Pass? The Barcelona Pass also includes a free guide and map. What isn’t covered by the Barcelona Pass? Despite the fact that it covers most of Barcelona’s top attractions, the Barcelona Pass doesn’t include the Sagrada Familia, Park Güell or the Picasso museum which must be purchased separately. The Aerobus, fast shuttle bus from the airport to the city centre is also not covered by the Barcelona Pass. How does the Barcelona Pass work? Barcelona Passes are valid for 2 or 3 consecutive days and are activated the first time to use them. To use the pass you show it at the ticket office of each of the attractions. 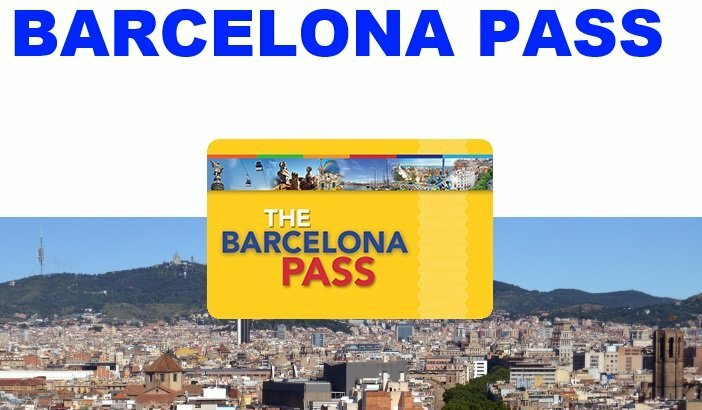 The Barcelona Pass has a maximum purse value (€200 for the 2 day pass and €275 for the 3 day pass) once this limit is reached the pass automatically expires. If you’ll be using public transport the Hola Barcelona! travel pass, which gives unlimited travel on public transport within Barcelona, can be added to your pass. When you book your Barcelona Pass online you can choose whether to get it delivered to you before you travel (extra cost) or pick it up from the redemption centre near La Rambla. Free entry to 20 of Barcelona’s Top attractions. Collect your pass in the city centre or have it delivered to you before you travel. Doesn’t include entry to the Sagrada Familia or Park Güell. Travel pass not included, can be added at extra cost. As mentioned above, before purchasing your sightseeing pass you should decide which activities and attractions you are interested in. Don’t be too ambitious when making plans. Everyone has their own pace but I suggest that you plan to visit no more than 4 major attractions per day plus maybe a show or concert in the evening. Even this may be too rushed for some people. After that you should check to see whether any of the museums will be free at some point during your stay (see below). Ideally you should try to come up with a rough itinerary. Select Standard Price (Adult) from the list above and tick the check boxes next to the attractions, activites and tours you plan to visit. At this point the price shown in the Sum of Selected Items (Euros) field is the price that you will pay if you purchase your tickets from the ticket window at each of the attractions. To see how much you would save by purchasing your tickets online (from Barcelona Tourism or other websites) select Online Price (Adult). The options public transport pass 48hrs, 72hrs, 96hrs and 120hrs add the cost of a transport pass to your selection (more information below). You can then compare what you would pay if you purchase a Barcelona Card, Barcelona Card Express or Barcelona City Pass by selecting them from the drop down list. The price displayed by the calculator doesn’t include the cost of the sightseeing passes. For example, if you are thinking of purchasing a 120 hour Barcelona Card, you should select the 120 hour travel pass plus the attractions and tours that you are interested in and add the Sum of Selected Items (Euros) to the price of the Barcelona Card (as shown in the article above). Note: I haven’t included the other sightseeing passes reviewed above in the calculator because they are fixed price tickets and the price shown at the end of each review can be compared directly with the standard ticket price shown in the calculator. The calculator is a work in progress and currently compares the cost of adult tickets at a selection of attractions based on the sights, tours and activities which are covered by the Barcelona card plus a few popular sites which aren’t included. If any of the attractions selected aren’t covered by the chosen pass then the calculator adds the standard ticket price for the attraction (as if you paid for the ticket at the ticket window). In the future I plan to expand the range of activities which are included and add child tickets and other sightseeing passes. I make every effort to ensure that the information on this page is as comprehensive and up to date as possible. However, I still recommend that you double check prices before making a purchase. If you experience problems, notice errors or have any suggestions as to how I could improve the calculator, please tell me about it by leaving a comment below. Students are entitled to discounts at a large number of museums and attractions. The discount varies widely, many museums for example are free whereas other attractions offer a discount in the region of 20% to 50%. In order to qualify you will need an International Student Identity Card. There’s a full list of available discounts on the ISIC website. Seniors (65 years or older) pay a reduced rate at most museums and attractions. Some museums are free for seniors. Check the websites of the places that you are interested in for more information. In order to qualify you are required to show photo ID with your date of birth on it (passport, driving license etc.). Spanish residents who are over 65 are also entitled to discounted fares on public transport. Most museums and many other attractions offer discounts for disabled visitors and in most cases for one accompanying person. The discount varies and at some sites is 100%. Most attractions websites state that you need to show a certificate showing that you have at least 65% disability (this is common in Spain and other European countries). If your home country doesn’t issue similar certificates then you should bring whatever card you would use to claim disability discounts at home, for example a transport pass. Some museums offer discounts for unemployed people. This only applies to Spanish residents who are registered unemployed with the INEM (Instituto Nacional de EMpleo). The following museums can be visited free of charge at certain times. Free entry on May 18th and September 24th. Free entry on the last Sunday of every month, April 23rd, May 18, September 11th. Free on Saturday afternoons from 3pm, the first Sunday of every month, May 18, September 11th and September 24th. Free on Sunday afternoons from 3pm, February 12th, May 18, and September 24th. Free on the first Sunday of the month, April 23rd, May 18, September 11th, and September 24th. Free on Thursday evenings from 6pm to 9:30 pm and the first Sunday of every month, May 18th September 24th. The museum’s capacity is strictly limited. In addition to discount or free entry at attractions, many sightseeing passes also include free unlimited public transport or the option of adding a travel pass. Before making your decision, it’s worth comparing the price with the cost of individual tickets. The Hola Barcelona! 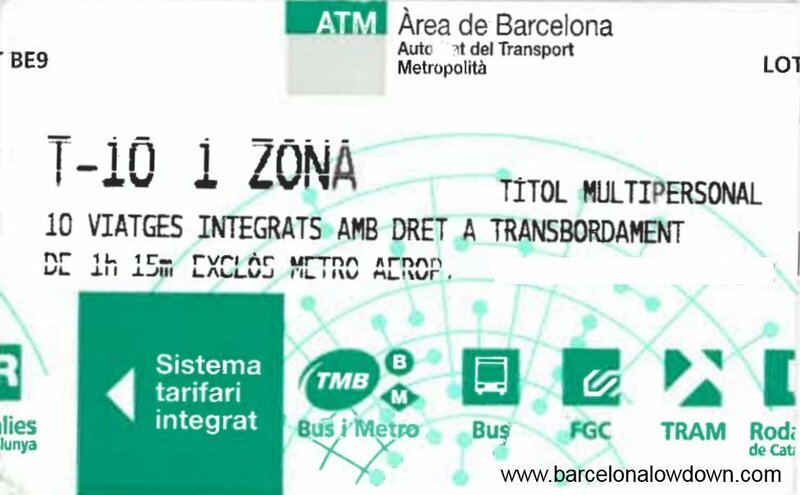 transport pass offers visitors unlimited travel on metro, bus, tram and commuter trains within travel zone 1 which includes Barcelona and some surrounding towns. This includes the airport metro and train but doesn’t include the night bus or Aerobus. The pass is available for periods of 48, 72, 96 and 120 consecutive hours. The time is counted from the first time you use the ticket NOT calendar days. 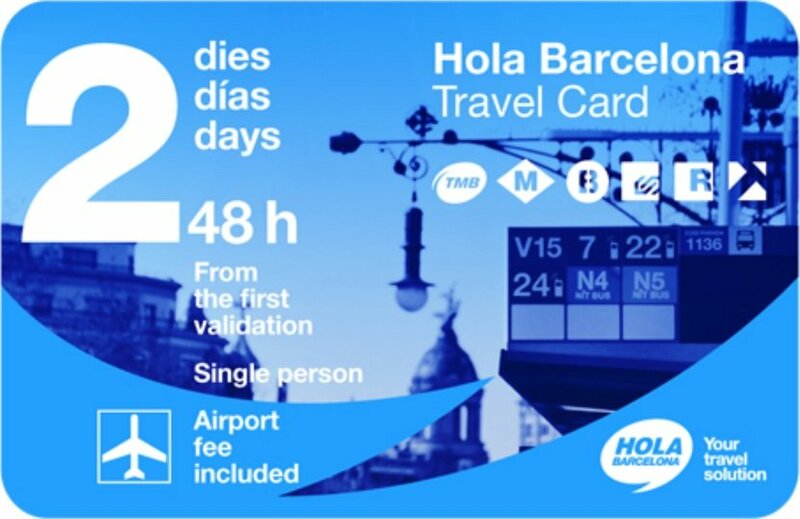 Hola Barcelona travel cards are available at train and metro stations, Barcelona Tourism offices or in advance online (5% discount). Unlimited travel on public transport in Barcelona and some surrounding towns. Most Barcelona residents use the T-10 when travelling on public transport. The card costs €10.20 for 10 journeys within TMB transport zone 1 and allows you to transfer between different modes of transport within one journey. For example if you catch the train from the airport to Passeig de Gràcia train station then transfer to the metro for the final stage of the journey to your hotel this will count as one of the 10 journeys. The T-10 can be used on the metro, commuter trains (operated by RENFE and FGC), TMB buses (including the night buses) and trams. There are different version available which are valid for 1 or more zones. Barcelona plus some surrounding towns are all included in zone 1. How does the T-10 travel pass work? Using the T-10 is simple, you just have to remember to validate it at the start of the journey and when you transfer from one mode of transport to the other. In the case of the metro this means passing the ticket through the ticket barrier. There are ticket validating machines near the doors on buses and trams. When you validate the T-10 a number is stamped on the reverse of the ticket. The last digit of the number is the number of journeys remaining. If you change from one mode of transport to another, you have to validate the T-10 again but (as long as you don’t double back on yourself and are within the time limit) it doesn’t get stamped again. The T-10 is a multi-person card, meaning that 2 or more people who are travelling together can share one card. You must remember to validate the T-10 once per person (so the card gets stamped once per person). It’s important that you all travel together for the entire journey since ticket inspectors sometimes de on the spot checks. Where can I purchase a T-10 travel card? T-10s can be purchased at metro stations, train stations, tram stops and at some tobacconists (including the tobacconist in terminal 1 of Barcelona airport). Which is Best the T-10 or Hola Barcelona travel card? This is a question that I get asked a lot and my answer is always the same…. It depends! Generally speaking, if you will be using public transport for more than 7 journeys per day then the Hola Barcelona card works out cheaper. The Hola Barcelona! Card is valid for the airport metro which costs €4.60 which can make the Hola Barcelona card a good choice if you plan to use the metro to get from and to the airport. Whichever you choose, they are both good value when compared with purchasing single tickets for each journey. Valid for travel on metro, commuter trains, tram and TMB buses within zone 1 including the train from the airport. Which Barcelona sightseeing pass or discount card is best? As I said at the start of this article. Which pass you choose will depend on how long you plan to spend in Barcelona and what you want to do while you are here. All of the passes listed above can save you money when chosen wisely. I recommend that you start by deciding which attractions you want to visit and then use the Price Comparison Calculator to compare the sightseeing passes with the cost of buying tickets on the spot or online at the official Barcelona Tourism website. Depending on your interests, you might even find that you’re better off purchasing individual tickets instead of a discount card. Having said that. For most first time visitors, staying in Barcelona for 3 to 4 days and who plan to visit 5 or 6 of the main attractions, take a tour on the Hop On Hop Off Bus plus one or two other activities. 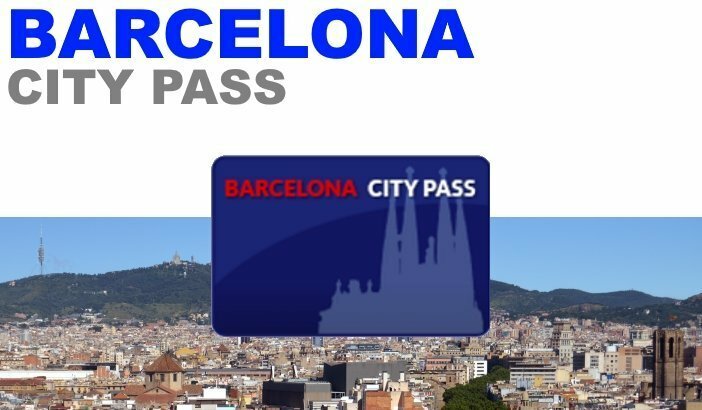 I think that the Barcelona City Pass combined with a T-10 travel card are a good choice. Hi, and thank you for your attention to so many details in your informative post! Very appreciated! So which is it? Also, if I purchase the card online now before my traveling to Barcelona, am I able to take advantage of the discounts etc. when booking tours/attractions in advance online? Or can I only make use of the discount if purchasing the tickets on the spot after I have validated the card? Thanks for your comment, I’ve tried to make the post as detailed and informative as possible. About the validity of the Barcelona Card. I can confirm that the cards are valid for a number of consecutive hours starting from the first use (48, 72, 96 or 120 hours). The confusion has arisen because, up until 2 years ago, the Barcelona Card used to be valid for a number of calendar days days and expired at midnight (as you stated in your comment). This is no longer true but unfortunately there are still lots of websites which haven’t updated yet and still show out of date information. The website you mentioned isn’t the official Barcelona Card site. As far as I can see it’s an affiliate site. This means that the website owner earns a small commission if you purchase the card from one of the links on the site. The same as I do if you purchase your Barcelona Card from one of the links on this page. You can only use the Barcelona Card to get discounts when purchasing your tickets on the spot, at the attractions. Not when purchasing tickets online. Thank you for the wonderful tips above. We’ll be staying in Barcelona for 3 full days. Arriving at BCN airport and leaving via train to Madrid. There’s 3 in our family. We have a free Hop on Hop off for a day from our hotel. We plan to visit the La Sagrada Familia, Park Guell, La Pedrera, Picasso Museum and maybe a few others if time permits. Which of the Barcelona discount cards would you recommend? Or maybe we’re better off getting the 10 tickets pack for the metro and purchasing individual tickets (maybe get the Gaudi Bundle) instead. Thanks for your comment, I’m glad you found the post helpful. Also, since you already have the Hop On-Hop Off bus covered (I’d be interested to know which hotel gives it away free) then (assuming that you want the audio guide) the Gaudi bundle plus individual tickets for the other sites will be your best bet. As mentioned in the post above, the Gaudi bundle is convenient because it allows you to buy both tickets together but if you don’t want the included audio guide it would actually work out cheaper to buy the tickets online individually. Personally speaking, especially if it’s your first visit, I think that the audio guide is worth the small additional cost. By the way, if you’ve already bought your train tickets to Madrid they should have a code on them which entitles you to a free commuter train ticket to Barcelona Sants train station (more info in this post) so if you are staying near to Plaça de Catalunya, Passeig de Gracia, Arc de Triomf or El Clot you could use this to get to the train station for free on the last day. Have a great time in Barcelona and if you have any more questions feel free to ask.